I had the pleasure of joining Donna DeLaBriandais and several other sketchers on Saturday, January 12 for a little sketch crawl in Healdsburg. It was a gorgeous day even though it was rather chilly and windy. We even had a couple passing rain showers to keep things interesting. I hadn’t been out to sketch in quite a while; it felt so good to put pen to paper. Healdsburg is a fantastic place to draw with the charming plaza in the center of town and the interesting architecture. I’ll definitely want to visit for another round soon. 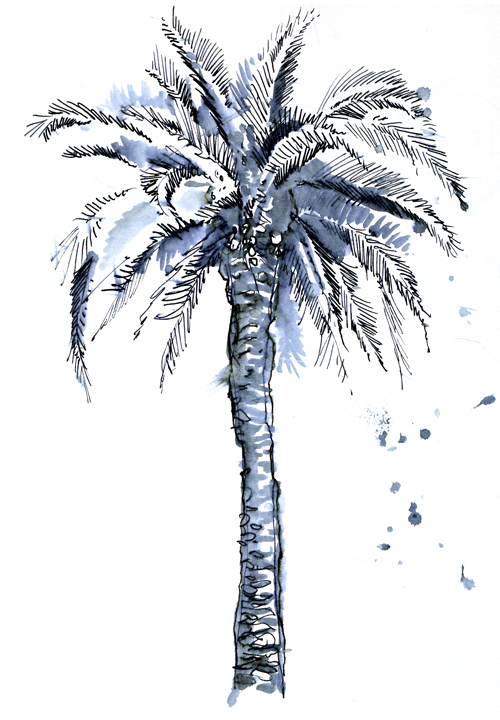 Below is one of the palm trees that stands in the plaza, along with some ink from the following page that flipped over as it started to rain. That was my cue to take a break and duck into a coffee shop for a nice soy latte. Thanks Donna, for spearheading the session. I look forward to sketching with you again soon.